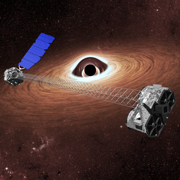 NASA's Nuclear Spectroscopic Telescope Array, or NuSTAR, a premier black-hole hunter among other talents, has finished up its two-year prime mission, and will be moving onto its next phase, a two-year extension. A collection of images from NuSTAR's 2nd Birthday celebrations around the world. Three professors at Caltech have been elected to the prestigious National Academy of Sciences. The announcement was made Tuesday, April 29, in Washington D.C. The new Caltech electees are Gregory C. Fu, Altair Professor of Chemistry; Fiona A. Harrison, Benjamin M. Rosen Professor of Physics; and John P. Preskill, Richard P. Feynman Professor of Theoretical Physics. The American Academy of Arts and Sciences has elected three Caltech faculty members as academy fellows. They are John F. Brady, Chevron Professor of Chemical Engineering and Mechanical Engineering and executive officer for chemical engineering; Kenneth A. Farley, W. M. Keck Foundation Professor of Geochemistry and chair of the Division of Geological and Planetary Sciences; and Fiona A. Harrison, Benjamin M. Rosen Professor of Physics. Two high school seniors from Long Island are among the top 10 winners named Tuesday night in the prestigious Intel Science Talent Search competition, chosen from among 40 finalists across the country competing in Washington, D.C.